FRANKFURT (Reuters) -- Shares in German automaker Porsche Automobil Holding SE started the new year strong after a U.S. judge dismissed a hedge fund lawsuit seeking more than $2 billion in damages, removing a key obstacle to a merger with Volkswagen AG. Shares in the Stuttgart-based automaker reached a 52-week high of 70.15 euros on Tuesday before finishing the day down a fraction at 68.52 euros. The shares rose 15 percent on Monday. "We regard this as ... positive news for Porsche SE shareholders as the biggest risk to the merger with VW has been removed," Credit Suisse analysts said. The lawsuit had delayed attempts by Volkswagen to fold Porsche into its operations next year and the ruling opens the door for a planned rights issue by Porsche. "[This ruling] clearly paves the way for the planned rights issue at Porsche SE to raise 5 billion euros ($6.7 billion) in the first half of 2011," DZ Bank analyst Michael Punzet said. Late last week, U.S. District Judge Harold Baer said hedge funds led by Elliott Associates and Black Diamond Offshore Ltd., could not maintain securities fraud claims based on Porsche's tactics when it tried to take over VW in 2008. 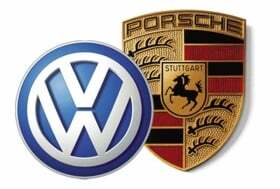 The hedge funds alleged they were victimized when Porsche covertly bought a stake of Volkswagen ordinary shares using swap instruments as part of a so-called "sneak attack" method plan to take over Europe's largest auto maker. Spain's ACS used similar tactics to amass a stake of almost 30 percent in Germany's Hochtief , while auto supplier Schaeffler Group bought up a stake in larger rival Continental AG using swap agreements that skirted disclosure rules. When Porsche revealed its holding in October 2008, shares of VW soared, briefly making the company the world's biggest by market value and causing losses for hedge funds which had bet on a share price decline. Baer dismissed most of the plaintiffs' claims with prejudice, meaning they cannot be brought again. The ruling came after the closing of the market on Thursday. On Friday the German stock market was closed for New Year.